Theoren Fleury has a new book out. He is currently on tour across Canada, promoting the book. This includes television and radio appearances, and book signings in local book stores. Unfortunately, I know very few people in Canada. How would I ever get a copy of Playing With Fire with Theo's autograph? More on that later, first little back story. A flashback, if you will. 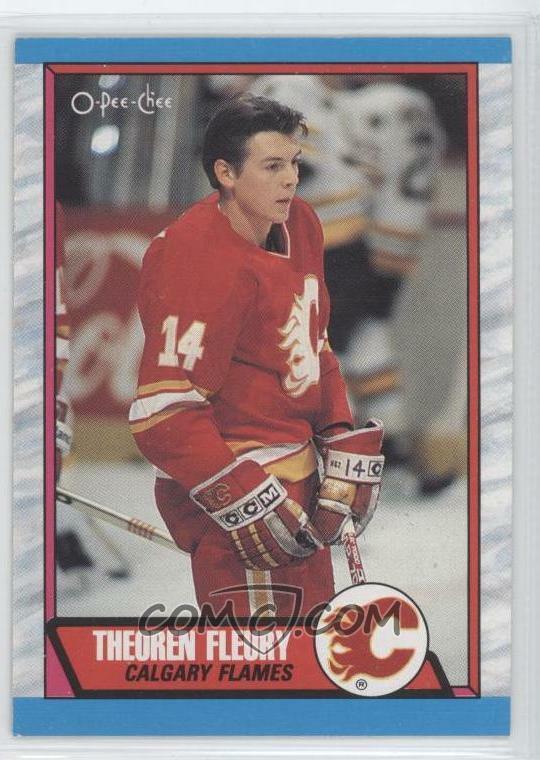 Theoren Fleury was/is the reason I got into hockey. He is and will always be my favourite player of all time, forever and ever. Fleury is also the reason I am a huge Calgary Flames Fan. Back when the Sharks played at the Cow Palace, my dad took me to my first hockey game. I wanted to see Fleury play. He was easy to spot, not only because he was small. But, he just signed with Jofa/Titan and his Jofa helmet was a brighter red than his team mates. I really do not remember the out come of the game. Pretty sure the Flames won. After the game, we went to where the players area. I wanted to meet him. I had a drawing that I did of him in art class. Security did not allow us back in the dressing room area, but one security lady asked if I wanted my poster signed. I had a Sharpie clipped to the drawing, she took it to the back. A few minutes later, she walked out and handed me my drawing with Fleury's autograph on it. That was awesome, you can see how I totally forgot who won the game. Yeah, I still have that drawing somewhere in my parent's house. Obviously, I was a huge collector of Fleury hockey cards. I got my hands on a few 1989-90 O-Pee-Chee #232 cards. I decided to get one signed. So, I wrote a fan letter to Fleury, and sent it to the Olympic Saddledome, the only address I had for Fleury. I enclosed the card and self addressed stamped envelope. A few months later, I got it back...signed! I realise that I sound like an eighth grade girl, here. But, I was really excited. Fast forward a few years at another Sharks game. I wore my Flames jersey, hoping to get it signed. This time, I waited outside where the players exited the building. I greeted a bunch of the Flames players. Most of the Flames players walked out, but he was in the back seat of a car. I tried to get his attention so I could get my jersey signed. He kinda ignored me, I could barely see him through the tinted glass. Anyway, Trevor Kidd walked up to me and asked if I wanted my jersey signed. What was I to do? The guy is like 6'-2", I am like 5'-6". So now, I have a Fleury jersey with Kidd's signature on it. Kinda like having a picture of Sean Connery, signed by Roger Moore. Back to the book signing. Yesterday, Fleury was doing his signing in Calgary. I contacted the only person I knew in Calgary. Actually, we have never met. I read her blog, and she tells me to update mine more so she can read mine. We follow each other on a few online social networks, that is about it. Basically, I asked if she wanted to stand in line for a few hours and get a signed copy of Theo's book, all for someone she does not even really know. Well, she agreed to it. She even wrote about it on her blog. I guess the book is on its way, I will update with photos when I get it. Thanks again to walkinvisible, I owe you big time! Theoren Fleury's tell all book is out today. "A first hand account of Theo's heartpounding journey. Theo's self insight makes for a real page turner!" "Theo Fleury, at 5'6" made a name for himself in a game played by giants. A star in junior hockey, he became an integral part of the Calgary Flames’ Stanley Cup win in 1989. Fleury’s talent was such that despite a growing drug habit and erratic, inexplicable behaviour on and off the ice, Wayne Gretzky believed in him. He became a key member of the gold medal–winning men’s hockey team at the 2002 Olympics. The Colorado Avalanche picked up Fleury for the playoffs, and when he signed with the New York Rangers, he was a kid in a candy store. After one season of his next multi-million-dollar deal, this time with the Chicago Blackhawks, Fleury suddenly called it quits and wouldn’t explain why. In Playing with Fire, Theo Fleury takes us behind the bench during his glorious days as an NHL player and talks about growing up devastatingly poor and in chaos at home. Dark personal issues haunted him, with drinking, drugs, gambling and girls ultimately derailing his Hall of Fame–calibre career." For years, I have heard the rumor that former NHL defenseman Paul Coffey wore skates that were two sizes smaller. I think this is a myth. Why? First of all, have you ever put on shoes that were a half size too small? Not fun. You immediately take them off. Imagine walking in those shoes for an hour...now imagine skating in them. Yeah, not gonna happen. Secondly, and more importantly, skate sizes run large. So, you would not be wearing the same size shoe as you do with skates. I just got an new pair of skates, since I am playing hockey again. Here is the deal...why is there not a universal shoe/skate size? Now, I have lots of pairs of shoes. I am kinda a shoe whore, but not as much as most women. Yeah, I said it. In my adventures of looking for shoes, I have noticed that shoe sizes differ from company to company. Heck, they even differ from model to model. I have ordered 'custom' shoes from NikeID and while I order my usual Nike size, they fit about a half size too small. Note: Your feet do swell up in the middle of the day and depending on the temperature. Trust me on this, I used to work at an ice rink and I sold many pairs of skates. So, why is there not a universal size that we can refer to. Well, there kinda is. Let me explain, we will use my shoe size as an example. Why, because this is my blog and no one reads this anyways. In shoes, I wear a size US 8 (generally), which works out to be a UK 7, Euro 40.5, and 26.5cm. It translates to a size 6.5 skate. That last one, 26.5cm, which what the Japanese use to size their shoes. Notice they do not go by inches. Centimeters, an actual measurement of one's foot, something we can and should all go by. Like metric and SAE, the world will never agree on a standard on shoe sizes. I wish there was a standard shoe size...it would bring us a step closer to world peace. Okay, not really. But it would sure make my life, and yours, a whole lot easier when shopping for shoes...or skates. So, I paid to get this new domain, yet I rarely update. Is it a waste of money? Not really. But, I really should update this with more content. The trouble is, I never really liked to read or write. Oh well, I figured I should at least have something for October...and here it is. Hope you enjoyed it. Yeah, I know. You want your twenty seconds of your life back. I promise the next post will be better than this one...but not by much.